Winners of the #lovexubuntu Competition! As Xubuntu’s tenth anniversary year is now over, it’s time to announce the winners of the #lovexubuntu competition announced in June! The two grand prize winners, receiving a t-shirt and a sticker set, are Keith I Myers with his Xubuntu cookie cutters and Daniel Eriksson with a story of a happy customer. The three other finalists, each one receiving a set of Xubuntu stickers are Dina, Sabrin Islam and Michael Morozov. Finally, before presenting the winning submissions, let us thank everybody who submitted a story or a picture – we really appreciate it! For those who want to see more, all of the submissions are listed on the Xubuntu wiki on the Love Xubuntu 2016 page. After seeing a simple metal cookie cutter created by the Xubuntu Marketing lead, Keith was inspired to make a plastic 3D-printed version of the Xubuntu cookie cutter. He printed several of them and also shared the design on Thingiverse so others could also print it. If you decide to print and use these, we’d love to see the resulting cookies! 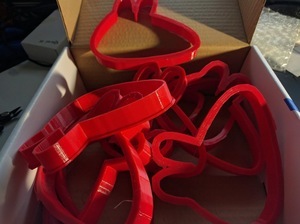 A box of 12 cookie cutters! It was a choice we have never regretted, as it has always fit our needs perfectly. We can get everything from design to workflow just as we want it, and it is stable as rock while still often introducing new features for us to play with. One of our best experiences was with a person who wanted an interface on a laptop that was just as simple and scaled down as that of an iPad, while still being able to do all things a computer ought to do. This was not an especially computer-savvy person, so it needed to be straightforward and simple. We managed to discard most classic desktop parameters and build a very unique interface, all within what was provided by stock Xubuntu. (Though we did some art ourselves.) It turned out great, our customer was very happy with it and other people have shown interest in having something similar on their computers. Needless to say, this was a success story for us which had not been possible without Xubuntu. I live in Israel, and in Hebrew, the slang word “Zubi” is an insolent and extreme way to say “No way I’ll do it”. Also, according to the Hebrew Wikipedia, Xubuntu is pronounced as “Zoo-boon-too” rather than “Ksoo-boon-too” (its name is written in Hebrew, which solves that ambiguity). I #LoveXubuntu because it’s top-notch, minimalistic neat and helps me focus on real things. As we look forward to 2017 and the 11th year of Xubuntu, keep an eye out for other ways you can help celebrate and promote Xubuntu. And as always, we could use more folks contributing directly to the development, testing and release of Xubuntu, see the Xubuntu Contributor Documentation to learn more.